Vernon has unbroken custody of these records. Copyright and or ownership has not been transferred to Guelph Public Library. Collection consists of city directories, which since 1875, have made up of two parts: an alphabetic listing of people’s last names giving their occupation and home address and of street names. The directories may also contain advertisements of local area businesses and brief facts on population and average household income. Earlier directories included communities other than Guelph such as Erin, Peel, Minto and Puslinch Townships. The directories are arranged chronologically by year. 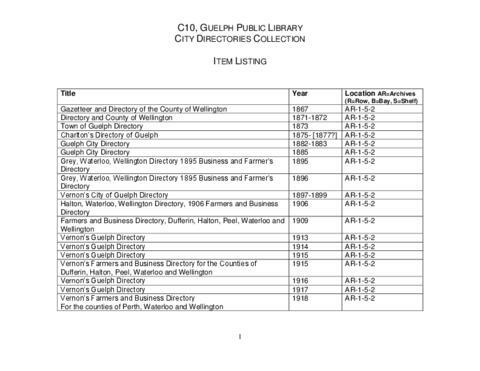 The Guelph Public Library does not have directories available for the years 1910, 1946, 1948, 1950, 1952, 1954, 1956, 1958, 1960, 1962, and 1965. For Directories dating 1867?-1980, consult microfilm copies available on a self-serve basis in the library. To access directories dating 1980 to 2013, ask at the Information Desk. Access to the originals have been closed for conservation reasons. See archivist for more details. More detailed listings are available for these records. No further accruals of records are expected.